PRO’s Armando Villarreal and Corey Parker were recently given their first FIFA honors, at the CONCACAF Under-20 Championship. The tournament, which is being held in Jamaica, runs from January 9 to January 24 and Villarreal took the whistle for his first FIFA assignment for the group stage game between Cuba and Honduras in Montego Bay. PRO AR Parker was also appointed to the match, which was his second game at the tournament. Honduras won the tie 3-0 with goals from Alberth Elis, John Suazo and Jhow Benavidez, and Villarreal brandished four yellow cards over the 90 minutes. 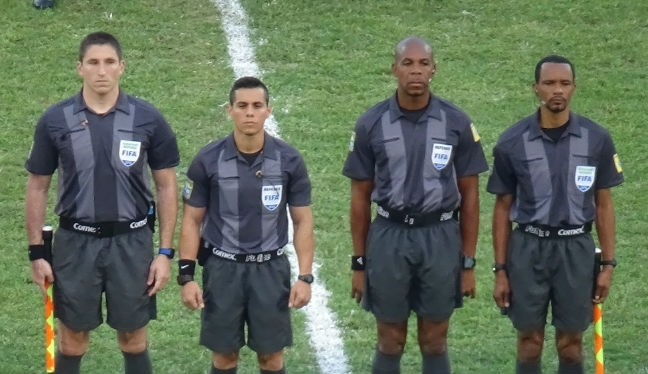 That inaugural center referee assignment for Villarreal came after the PRO duo were both assigned to Haiti versus Canada – Villarreal was on fourth official duties, while Parker took the flag for the first time as a FIFA official. PRO General Manager Peter Walton told proreferees.com: “It is a really proud moment to see Armando and Corey perform for the first time as FIFA officials. Villarreal and Parker also given the honor of officiating the key Group B game between leaders Mexico and second-placed El Salvador, on January 19. Mexico won the match meaning they qualified for the 2015 FIFA U20 World Cup.